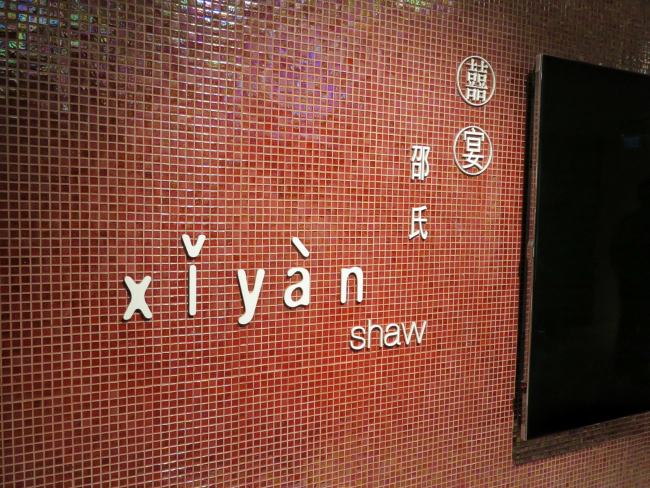 Xi Yan @ Shaw Centre~ A Hidden Gem in Shaw Centre. 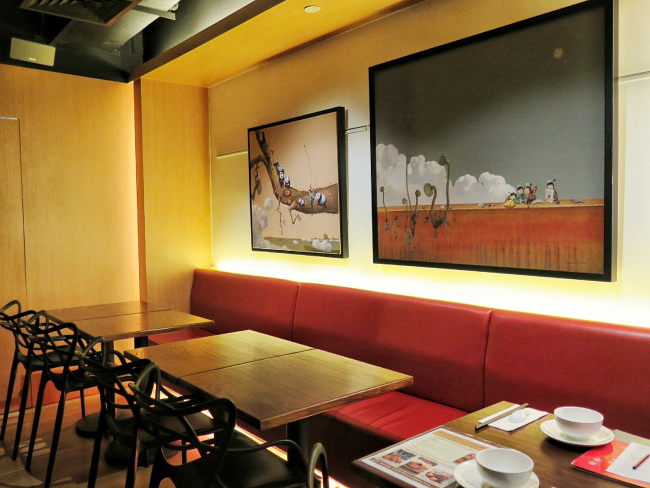 Xi Yan has opened a Casual Dining outlet in addition to the Private Dining Outlet. 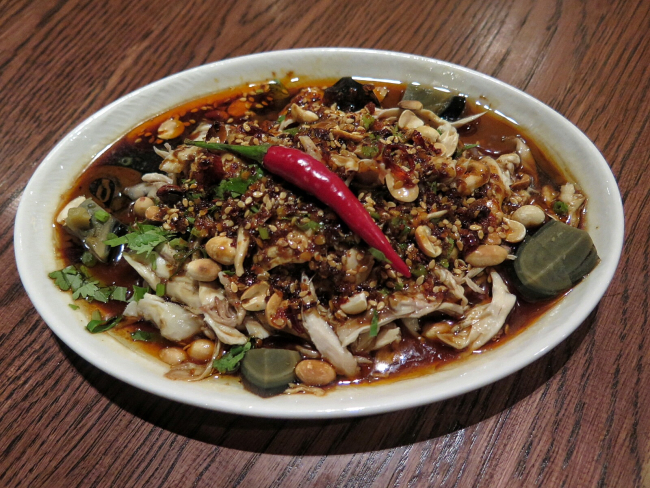 It is to bring the same quality and creative dishes from their private dining restaurant Xi Yan Craig Road to the mass market in a more relax ambience which is great for friends and family. I am so glad that they have invited me for a tasting! Special Thanks to Thomas for hosting us! The name "Xi Yan" remind me of wedding banquet which is always filled with fun and happiness. 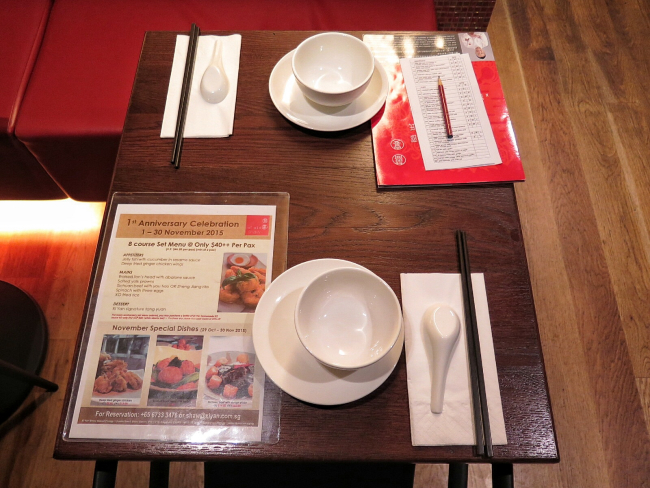 The colors used in the restaurant is also the auspicious red color. It gives a very bright and cheery ambience. The ambience together with the stunningly delicious food gives me the feeling of happiness. Currently, Shaw Centre has low human traffic as there are a lot of renovations going on. Surprisingly, on a thursday evening, the restaurant is still quite crowded. It shows that the restaurant must be very appealing to still be able to attract customers despite the tough surroundings. They swiftly brought us to our seats. They offer the dishes in 3 sizes (S is good for 2-3 people, M is good for 4-5 people and L is good for 6-7 people). 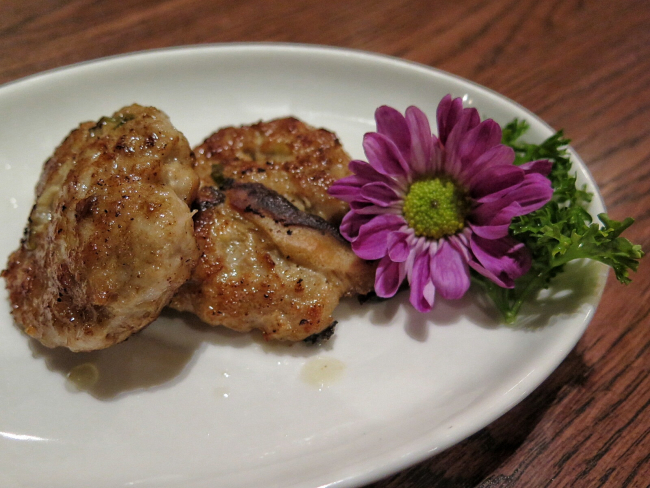 Thankfully, it was an invited tasting and I managed to request them to serve me smaller dishes to try more dishes. Pork Patty with Salted Fish and Water Chestnut~ It is a bit oily but it is so aromatic fragrant with the salted fish and water chestnut. A dish that is so simple and so delicious. 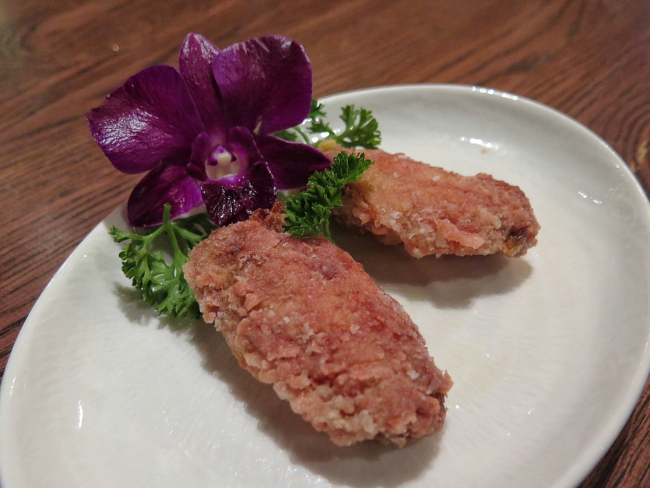 Fried Bean Curd Cheese Chicken Wings~ It is very crispy and tender inside. It resembles my favourite prawn paste chicken. However, it taste different with the aroma from the fermented bean curd. Salivating Spicy Chicken~ Indeed Salivating! The spicy kick is so shiok but very hot for me. Great for Chilli Lovers! Shiok Shiok! You will need to mix it well to coat the chicken shred with the gravy. Love the chicken shreds with the glass noodles. The different layers of textures from the different ingredients filled the dish with surprises. 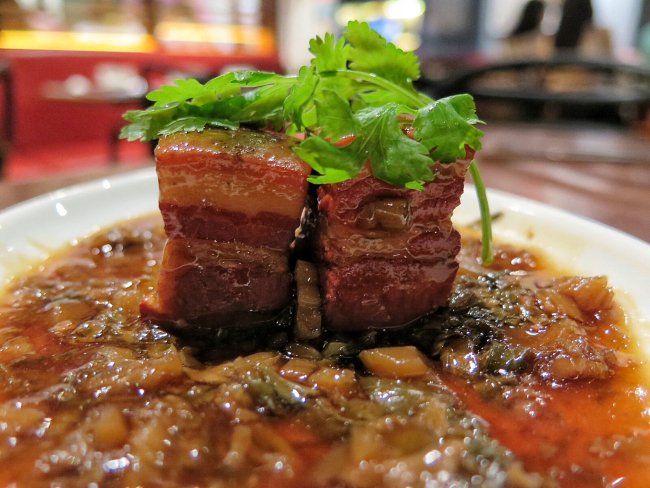 Sake Dongpo Pork with Mei Cai~ The well-balanced layers of fats and meat literally melt into my mouth as I bite through it. The Mei Cai is also not too heavy or salty. 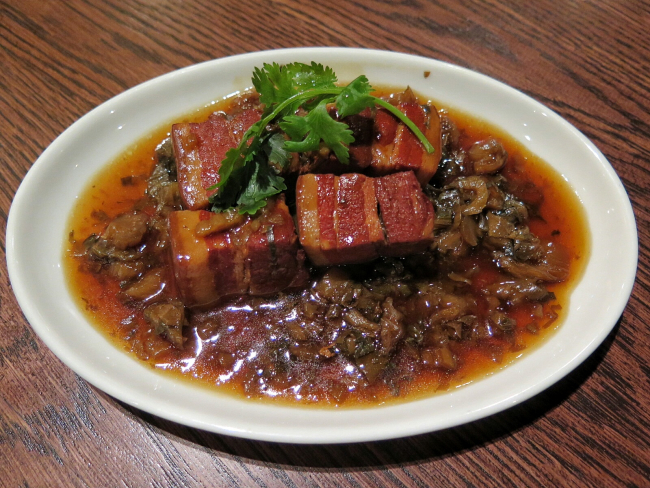 It complements well with the dongpo pork. 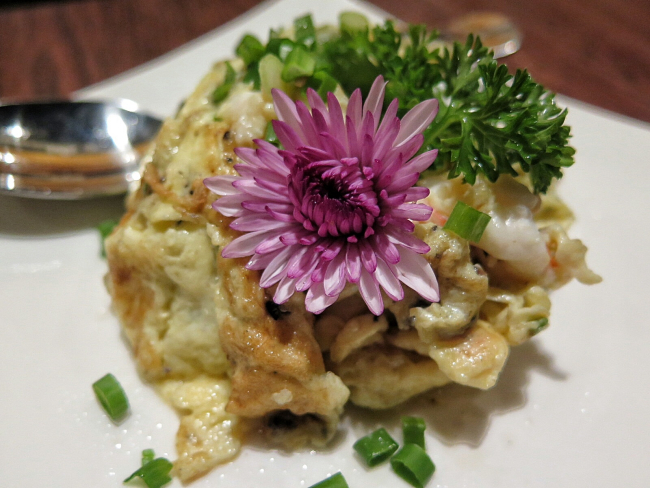 Black Truffle Prawns Omelette~ Truffle!!!! 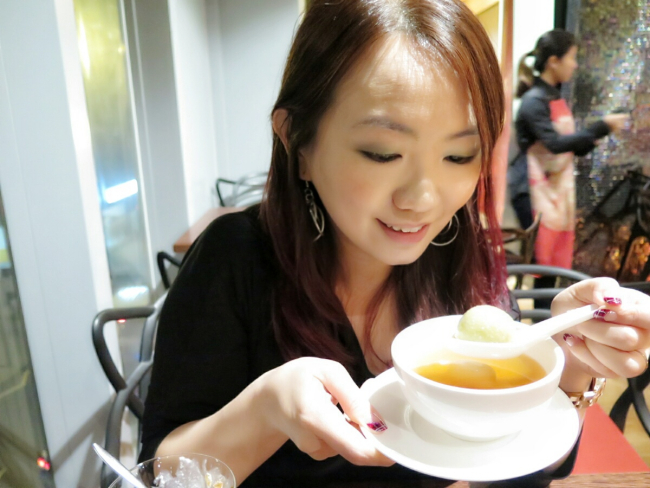 I am a truffle lover!~ Love the aroma and exquisite taste from truffle. 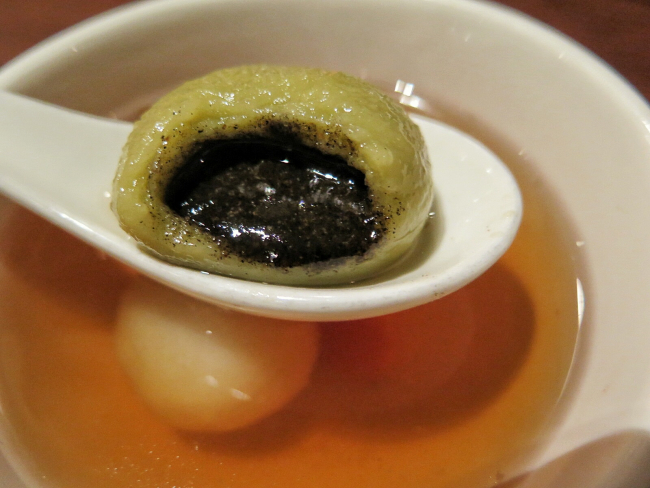 The prawn omelette together with black truffle is very smooth and fragrant. 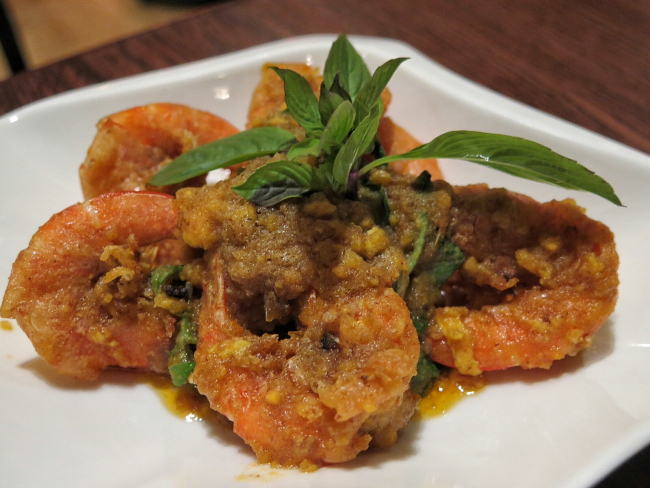 Basil Satay Prawns with salted egg yolk~ I always don't appreciate basil. 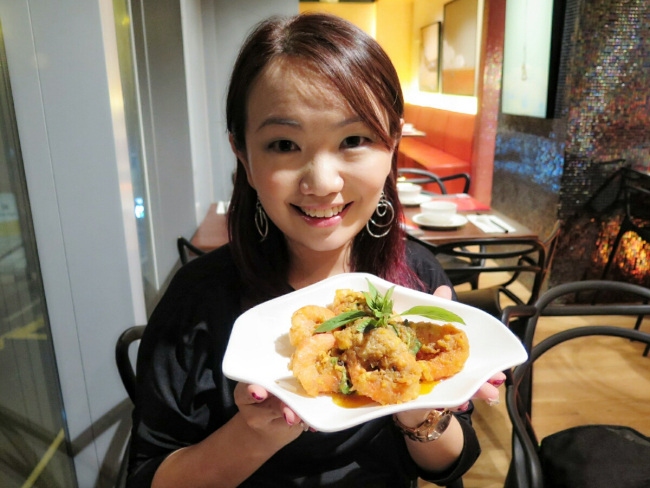 However, the basil enhanced the salted egg yolk flavours in this dish. The prawns are very fresh and delicious in deed. 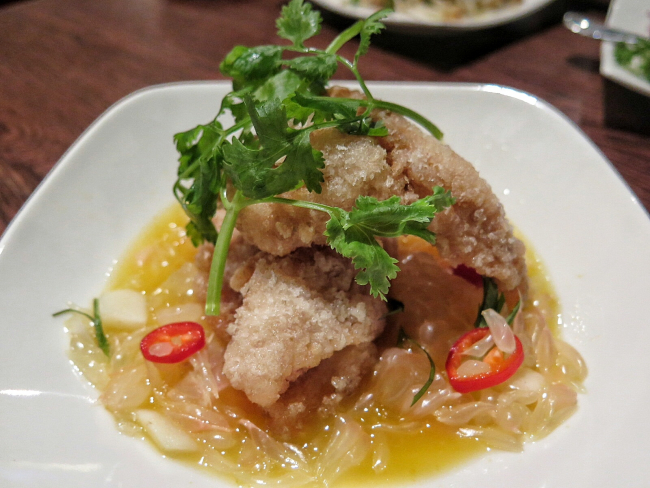 One of my favourite dishes from Xi Yan. Deep Fried shrimp paste fish fillet with pomelo chestnut salad ~ This dish is so unique! 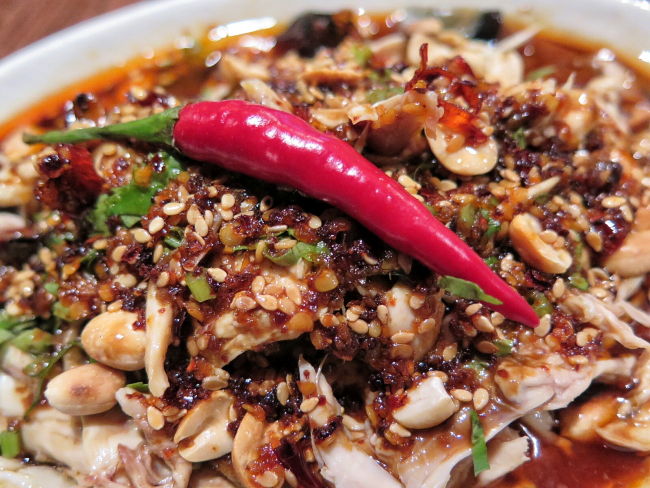 Love the dishes from Xi Yan. Their dishes are very exotic but delicious. 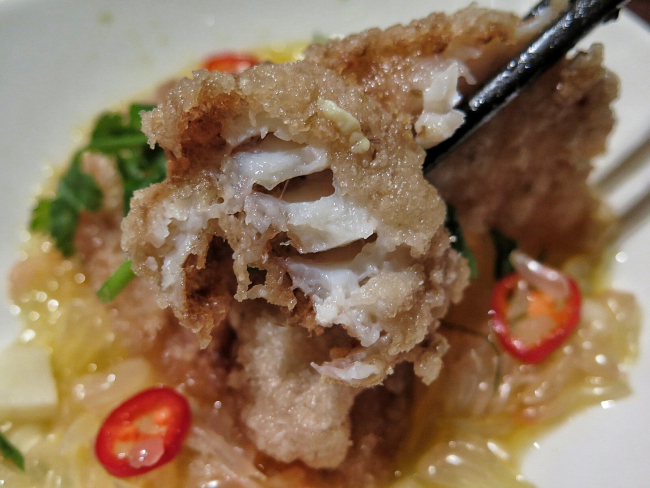 The fresh fish fillet is crispy outside and tender inside. 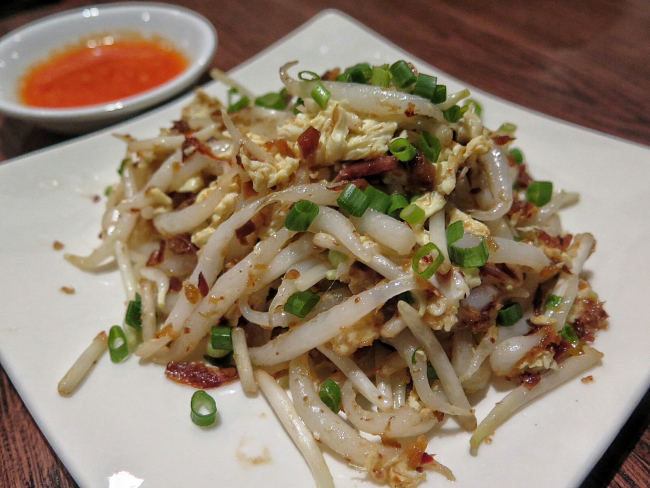 Together with the refreshing pomelo salad, it is so appetisingly tasty. 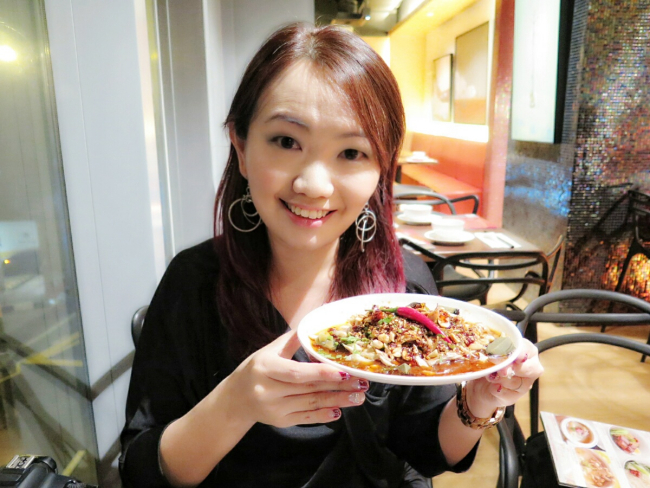 Fried Lo Shi Fan with Xi Yan XO Sauce~ The Lo Shi Fan taste differently from the usual one I had previously. It taste more QQ and fragrant with the XO Sauce. 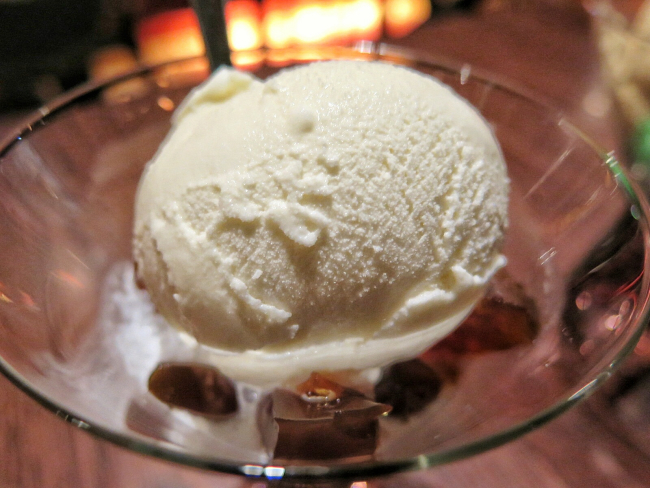 Coconut Ice Cream with Palm Sugar Jelly in Coconut Cream~ It is so smooth and creamy. I like that they serve it with jelly which gave the dessert a different texture. 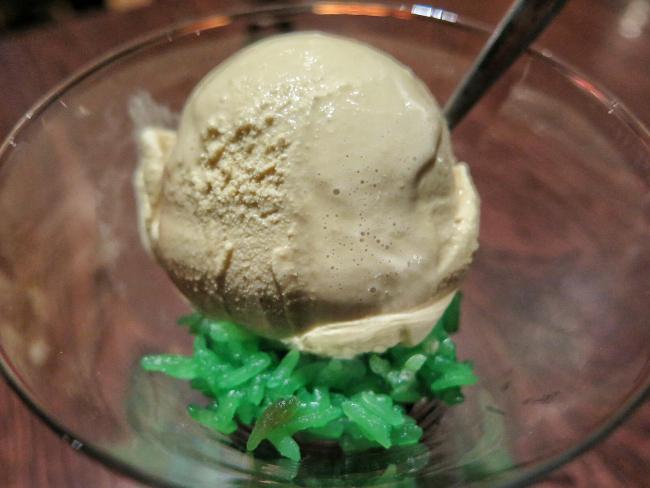 Palm Sugar Ice Cream with Pandan Glutinous Rice~ Omg! This is really very good! 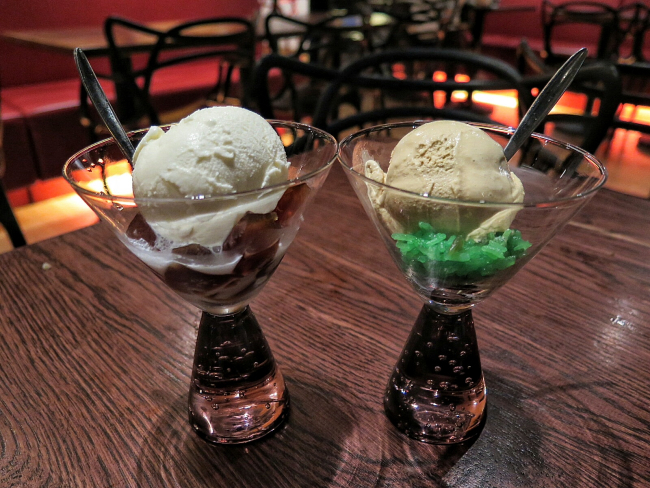 This dessert remind me of our Singapore Dessert - Chendol. 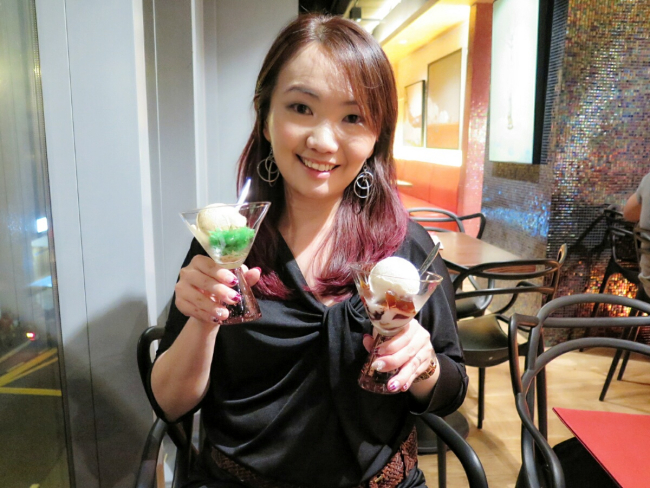 The ice cream is so fragrant and smooth. It is so creative that they offer glutinous rice in this way as it makes resembles Chendol even more. Chewy chewy pandan glutinous rice! The glasses they are served in are also very pretty. Black Sesame and Green Tea Glutinous Rice Dumpling and 5 elements Custard Glutinous Rice dumpling with sweet potato in ginger soup~ We were so full but still greedy to try the rice dumplings. Glad that they customise the dessert into just 1 of each type to let me try. The Black Sesame is very smooth and fragrant. The 5 Elements Custard is their signature dessert for many years. 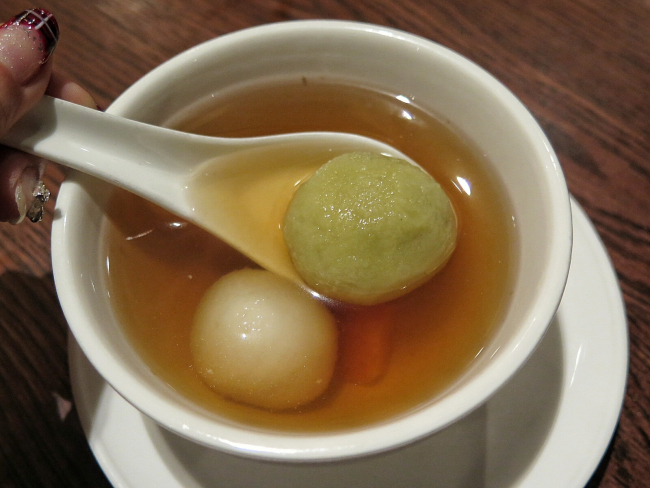 It consists of Winter Melon, Butter, Peanut, Sesame and Salted Egg. It is so unique! 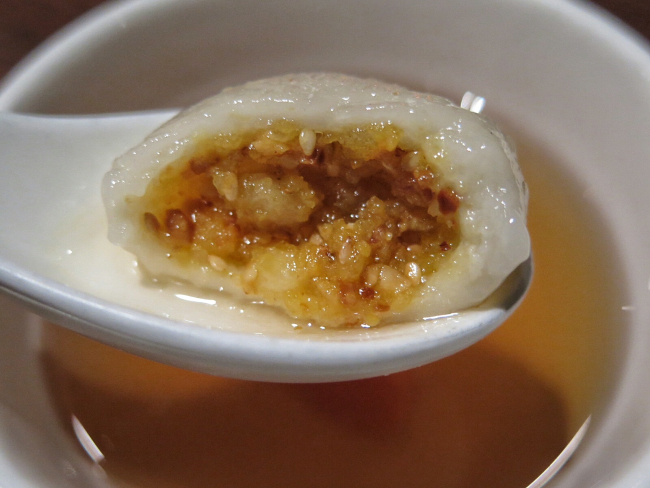 This is the first time I try such an unique filling of rice dumpling.